I recently blogged about my love of peach and corals, but this week was definitely a pink week! I'm a true girly girl and do love me some pink! More so this week, with a wedding to attend, summer nights, relaxing in the pool. 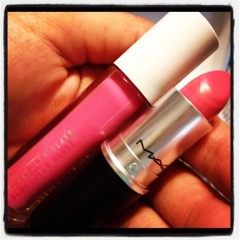 Pink is in my life for summer again:) I raved about MAC Speed Dial and MAC Dollymix, after having a browse in my friends makeup stash. Speed Dial is beautiful on it's own but for some extra kick I've been applying MAC Petite Indulgence Cremesheen glass (which was a Christmas gift from a friends who works at MAC). The outcome is beautiful! And I've gotten lots of compliment while wearing it. Pink cheeks is cute but as I'm in my 30's (early 30's ahem) I don't want anything to extreme. Enter MAC mineralize blush in Supernova, from the Heavenly Creatures Collection. This is the perfect addition to the shiny pink lips! 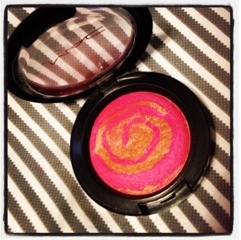 The golden swirl in Supernova gives a beautiful shimmer to my cheeks. It's pretty pigmented, so it only need a light hand! When I find a lip combo I love I usually wear it to death until I find something else- but I think this still has a few more times to be worn! 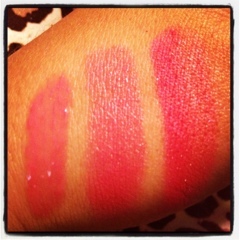 Swatches in the photo are: Petite Indulgence, Speed Dial, Supernova. Are there any pink lip combos I'm missing out on? 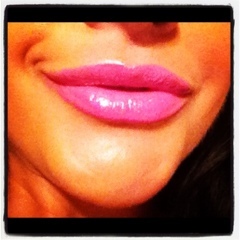 What's your favorite pink lip and gloss at the moment? 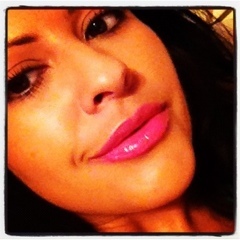 I am in love with that MAC blush, will look for it! There's no way you're in your 30's! You've got amazing skin! Really want to try the Heavenly Creatures range, the lipstick looks amazing on you! thanks for the comment- I love your blog!! GORGEOUS!! I bought Supernova and love it!! amazing! so bright and fun! love it! LOVE the pink lipstick- I just got some too! A pink lippie always makes me happy!